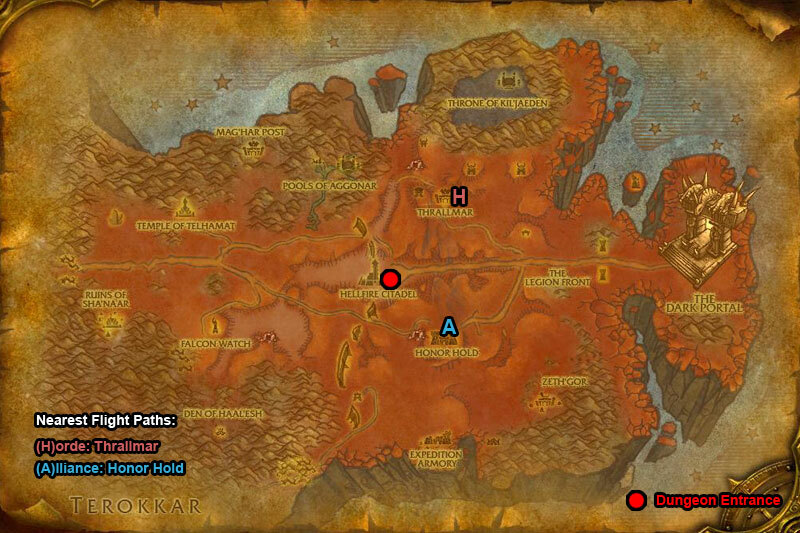 You can find the Hellfire Ramparts dungeon within Hellfire Peninsula, Outland. /i Deals physical damage to current target. Charges a player knocking all nearby back. The Hellfire Watchers inflict shadow damage & heal allies. Interrupt their Heal. /i Deals a lot of shadow damage to players. Pet Fiendish Hound steals health from a player. Heroic Differences: Bane of Treachery inflicts shadow damage to a player & all nearby. /i Deals physical damage & marks a player for Nazan to attack. Nazan deals fire damage & leaves patch of fire on floor. Uses Cone of Fire in front, avoid this. Heroic Differences: Nazan uses Bellowing Roar causing all near to flee.